Our experience of promoting fairer, more productive work dates back as far as the early 1990s. Together with our Dutch partners, we were the co-creators of the workplace innovation concept - which has now taken root in European Commission policy and in the economic strategies of several countries, including Scotland. Workplace innovation sees organisations as systems of interdependent parts which need to be considered as a whole, leading to simultaneous benefits for businesses and their employees, and is evidence-based. shared & distributed (‘co-created’) leadership. In 2013 we created The Essential Fifth Element, an actionable approach to workplace innovation which has since helped many companies achieve significant performance gains while also enhancing the well-being and engagement of employees at every level. Pharmaceuticals Reduced the impact of functional divisions to improve workflow, delegated decision-making to team and involved staff in innovation. Significant cost reduction and efficiency gains, and major steps towards creating a culture of improvement and innovation. Engineering Services Greater transparency and measures to engage staff, reducing functional silos and stimulating employee-driven innovation. 60+ ideas generated by employees; Martin Welsh (MD) argues that WIEP has placed the company 12 months ahead of its competitors. Packaging Leadership transparency; delegation of decision-making to frontline meetings; employee-led process mapping and improvement. WIEP played a vital role in changing work practices through DS Smith Lockerbie, leading to a £1.4m profit upturn without capital investment. Leadership transparency and enhanced 2-way communication with site-based teams combined with good practice teamwork principles. Significant improvements in meeting targets and an average improvement in profitability of 6% per project. Engineering Introduction of a representative ‘Shop Committee’ bringing employee voice into decision-making and stimulating ideas for improvement. MD claims that KPIs have all improved as a result of employee voice measures introduced by WIEP, building pride in the workplace. Contact us to discuss how The Essential Fifth Element can help your organisation. 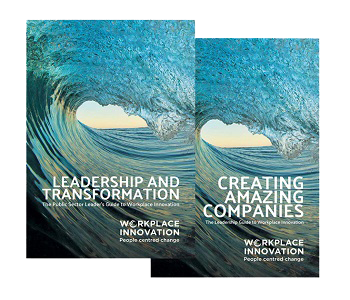 Our free Guide to Workplace Innovation offers inspiration and solutions, helping you assess current practice in your organisation, suggesting pathways to change, and signposting further sources of information and support. The Workplace Diagnostic is a unique, on-line employee survey tool, solidly based in research evidence and practical experience, and designed to assess a broad spectrum of workplace practices using evidence-based indicators. Find out more and try our short version here. Our unique distance learning and in person programmes accredit key people in your organisation as Workplace Innovation Practitioners, giving them the knowledge, competencies and resources they need to achieve successful and sustainable outcomes with the option of practical in-company facilitation and support. Participants also gain the Institute of Leadership & Management (ILM) Level 5 Certificate in Leadership and Management. Scottish Enterprise has announced the continuation of its nation-wide programme of workplace innovation and awarded Workplace Innovation Europe Limited (WIE) the contract to conduct the next 12 Masterclasses over a three year programme. Scottish Enterprise Masterclass. Guest speakers include Jeremy Ling, CEO at Bristan, Warren Glover, General Manager at the Lindum Group, and Professor dr. Steven Dhondt. Leadership for High Performing Organisations. A unique combination of leadership development and organisational change.